Thanks to the Environmental Protection Agency‘s 2014 TPEM program, Hipower Systems has several Tier 3 Flex Generators for sale. 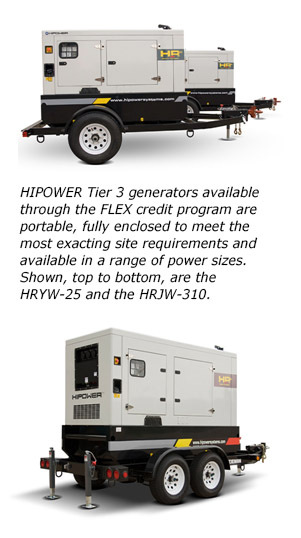 Hipower announced Aug. 11 that it has 100 of the credits, often referred to as Tier 4 FLEX credits, available for a variety of engines including John Deere and Yanmar that it must sell by Dec. 31, 2014. Manufacturers with FLEX credits can sell their customers Tier 3 generators and the purchaser avoids any requirement to upgrade to the final Tier 4 specification for the life of the engine. Hipower Systems President Rafael Acosta said he expects them to be gone long before the Dec. 31 deadline. All of the generators in which Hipower Systems can use the FLEX credits are rated for prime power and meet the EPA criteria for use in continuous application. Acosta indicated that with the adoption deadline for the Tier 4 Final standard on the horizon, he feels comfortable the government will not limit the sale of replacement parts on Tier 3 engines. “Customers can confidently purchase our eligible Tier 3 generators knowing they will be able to use them over the long haul,” Acosta concluded. Hi there! I was emailing to inquire about a tier 3 flex generator engine. Do you guys have any available for sale? I’m looking for a 70kw tier 3 flex engine. If you don’t have any do you know of anyone who does?